Well, it happened because of the concerted efforts of some barefooters. 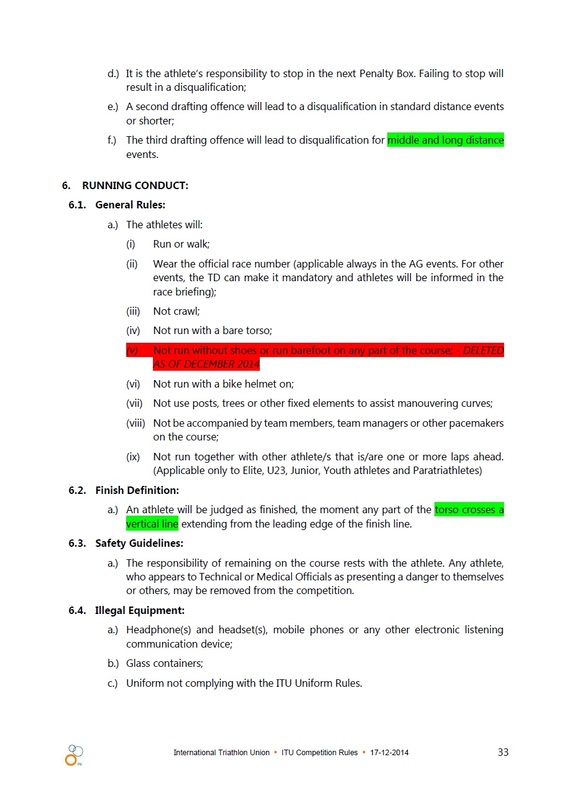 They took the effort to contact the ITU, educate them on barefoot running, and follow through. The driving factor was to be more inclusive with our rules, partly based on feedbacks from the groups you mentioned below. Those groups were the Society for Barefoot Living and the Barefoot Runners Society. Don’t ever let anybody tell you that you cannot make a difference. With the possibility of Matthew McConaughey starring in the Born to Run movie, it’s a smart decision they made to allow barefoot running in their events. I expect this “Born to Run” movie to be all about huaraches. Don’t hold your breath there will be real barefoot (skin to ground) running. A trailer, anyone? I honestly didn’t expect this to happen. Being a barefoot runner and a triathlete I’m really excited to race again finally! ¡Congratulations, pleasant win for the barefooters! I should think that if it is seen to give a bit of an advantage then more people will do it. I wonder how much time gets lost with changing and putting on shoes during triathlons. Grow up and put sum shoes on.